Home » Bathroom Help Category -- Also note those subcategories in the orange navigation, above! » Liz and Dave’s midcentury modern bathroom remodel: Hello, salt ‘n pepper wall tile! I “met” Liz when she commented on the story, Choosing wallpaper for Matt’s bathroom. 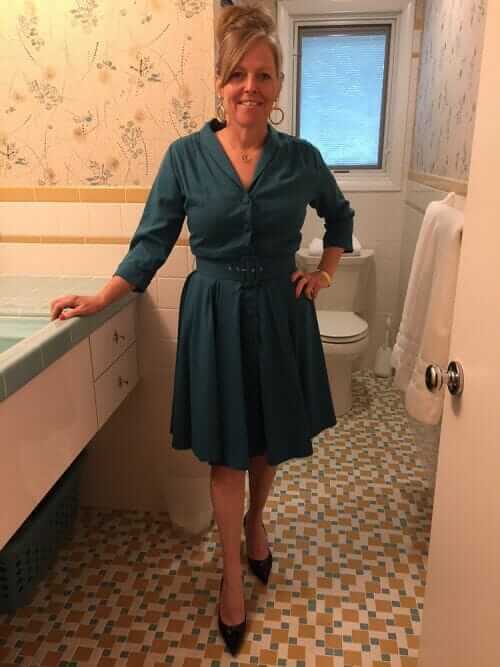 She said she had used the same vintage wallpaper I had recommended. So I followed up to hear more about her project. My husband, Dave, and I bought our 1960 split level house, from the original owners back in September of 1999. The house had no renovations so the list of repairs and upgrades was long. Heating and air-conditioning, roof, doors, windows, termite repair, tree removal, and electrical all came before we were ready to remodel the bathroom. But during all those jobs I was planning our bathroom. 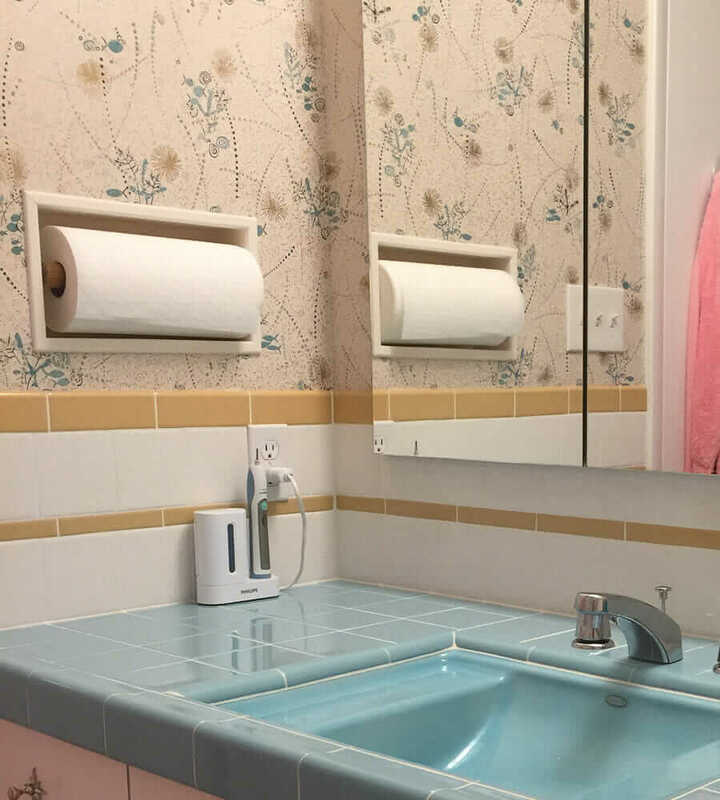 Your blog showed me that we would be able to have a bathroom that would look like the 1950’s. Finally in 2015 we hired C&C Home Renovations to do the work. Chuck from C&C had done our roof and several other projects and we knew the bathroom was too big a project for us. The bathroom was gutted down to the studs and we started from scratch, keeping only the basic footprint. The bathroom “before”. 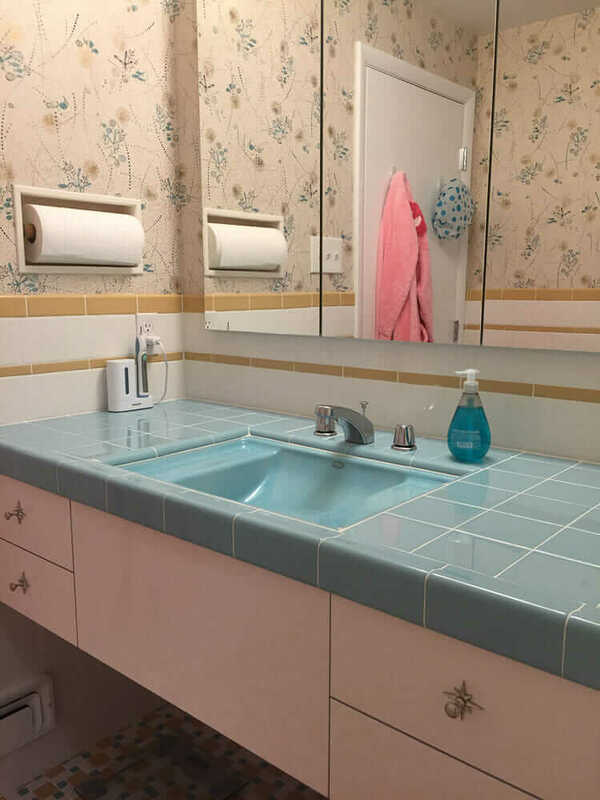 Liz and Dave needed to replace worn fixtures, and took the opportunity to do wrap-around wall tile, mosaic floor tile, and convert to a more functional for them shower. We removed the tub and made an oversized shower. Expanding the shower meant moving the toilet over a few inches. That seemed simple enough but also meant re-framing the window so that it would be centered over the toilet. We were glad we hired a contractor because little details like that sometimes turn into a lot of work. The vanity is another detail that took some contractor know-how. The original vanity was suspended between two walls and included two drawers. 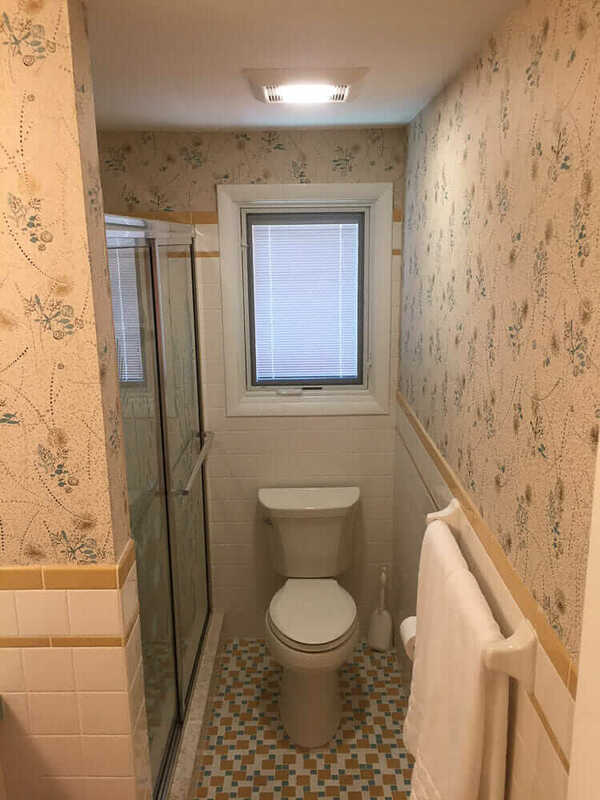 We liked that it kept a small space from looking crowded and provided extra storage so we wanted the same arrangement in the new bathroom. We ordered the new vanity with extra deep drawers for even more storage space. We were surprised however that the new vanity came in three pieces that were supposed to be screwed together. That was fine except it would never support the weight of a tile counter top and cast iron sink. Andy from C&C spent almost a day hiding 2-inch steel angle within the vanity, bolted into the wall framing so it’s super strong. When he was finished he sat on it and swung his legs around to demonstrate that it wasn’t going anywhere. This is really one drawer — it’s been automotive pin-striped to make it look like two drawers. 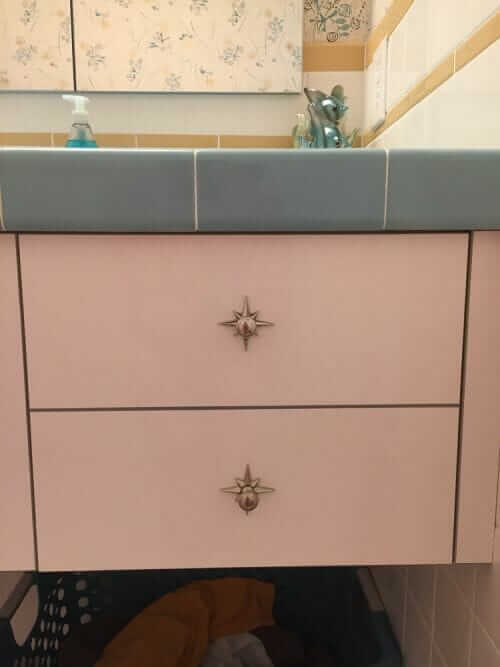 The extra deep drawers made the vanity look too imposing. Dave came up with the idea of making them each look like two drawers. He installed two pulls on each drawer as if they were two drawers and divided them with silver-gray automotive pin-striping tape. We were surprised at how it really looked like two drawers. And the pin-striping tape has lasted three years so far with no problem but if it ever wears out is simple enough to replace. I asked Chuck about having a design put on the shower doors. 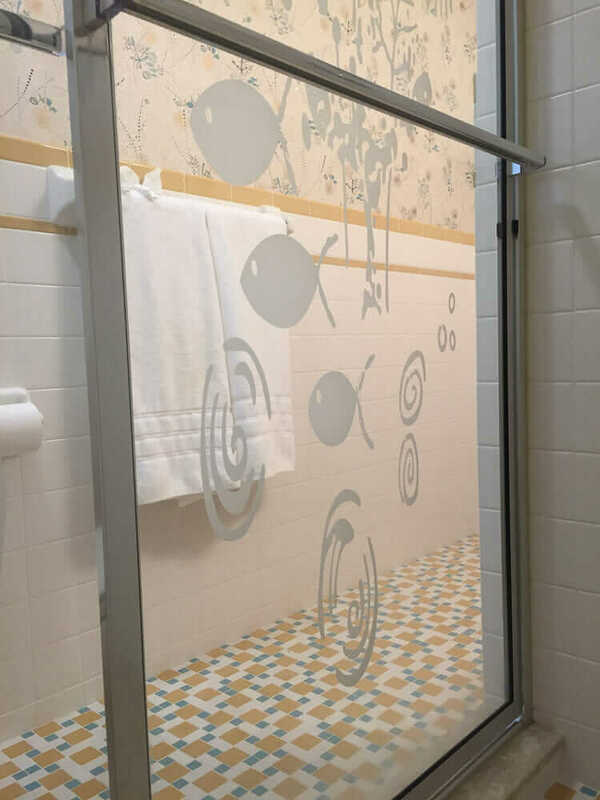 We like Chuck because the answer is always, “We can do whatever you want.” We sent a swatch of the wallpaper to the shower door manufacturer and they were able to sandblast the print, oversized, onto both doors in a mirror image so the design was symmetrical. Although the original counter was pink boomerang Formica (I know!) it was in bad shape underneath. Thanks to your blog I saw the aqua glow and the golden glitter colors from Daltile. We wanted the same colors in mosaic floor tile. It took a lot of shopping as you know because you keep being told, “Nobody does that anymore.” We knew better and persisted until we found someone willing to order what we wanted. And Phil Arena did a terrific job with the installation. 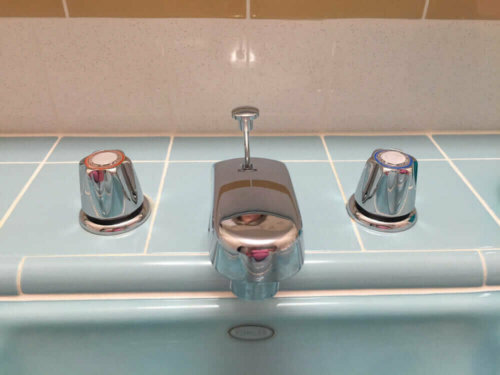 We could manage a tile back splash or other simple project and Dave had done repairs to the old tile a few times but I highly recommend you hire a professional if you’re doing the whole room, especially a shower that you don’t want leaking. Dave likes to have paper towels handy all around the house and the old bathroom had a roll screwed to the wall by the vanity. That wasn’t going to do for the new bathroom so we had a little niche built into the wall. It took a little ingenuity but we made it a true built-in by making the paper towel holder with a piece of wooden closet rod suspended between two window shade brackets. It’s homemade but it doesn’t show and works great. 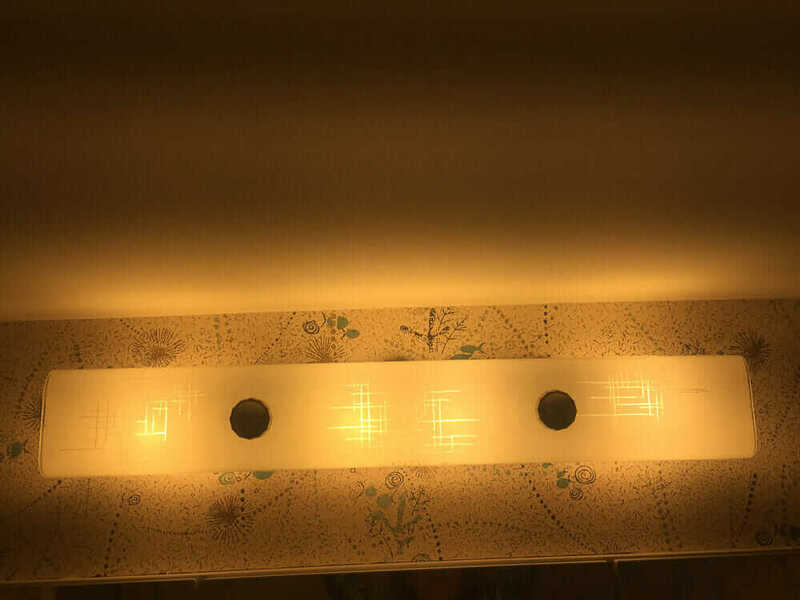 The light over the vanity is vintage from Ebay. Just to be safe Dave disassembled it a replaced the wiring and lamp sockets. All of those parts can be found online or at any home center. The last piece of the project was the wallpaper. We were shown a few different ideas that were OK but we didn’t love. I Googled “vintage wallpaper” and found the aqua fish with gold and black details and immediately knew it would be perfect. When it arrived it was even better in person. The background shimmers when the light hits it. 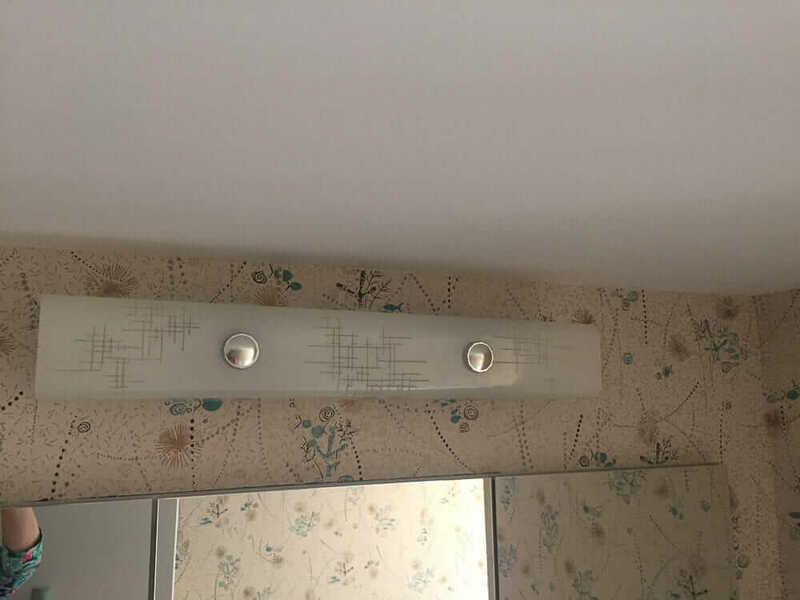 The wallpaper hanger had a tough time but eventually got the “hang” of it. The trick was that he had to replace the blade in his knife way more than he’s used to. Once he started doing that he was fine. As with most projects it took longer then expected but it was well worth the wait and effort. It still feels new to this day! Daltile Floor – Mosaic with Arctic White, Luminary Gold, and Aqua Glow. 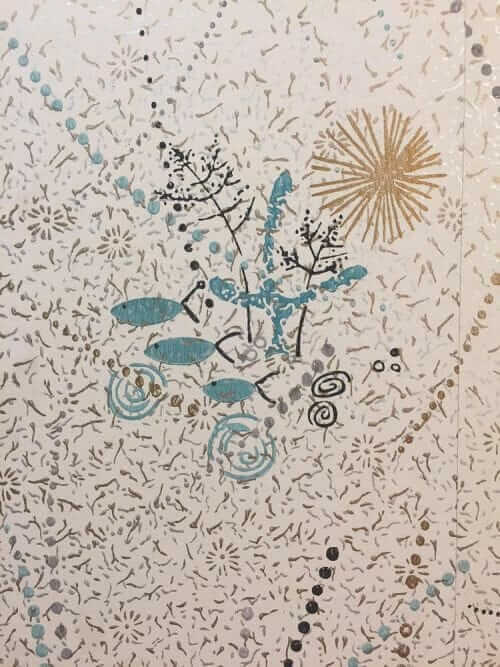 Pam notes: It looks like Liz used the Daltile custom mosaic designer to create that floor… alas, it seems to finally have been discontinued. Gorgeous, Liz and Dave — and what a meticulous job. And indeed: It looks as good as the day it was finished three years ago! Thanks so much for sharing! Looks great. Were you able to get/use mudcap, or is that bullnose on the top? I just can’t tell from the pictures. Love how everything turned out. 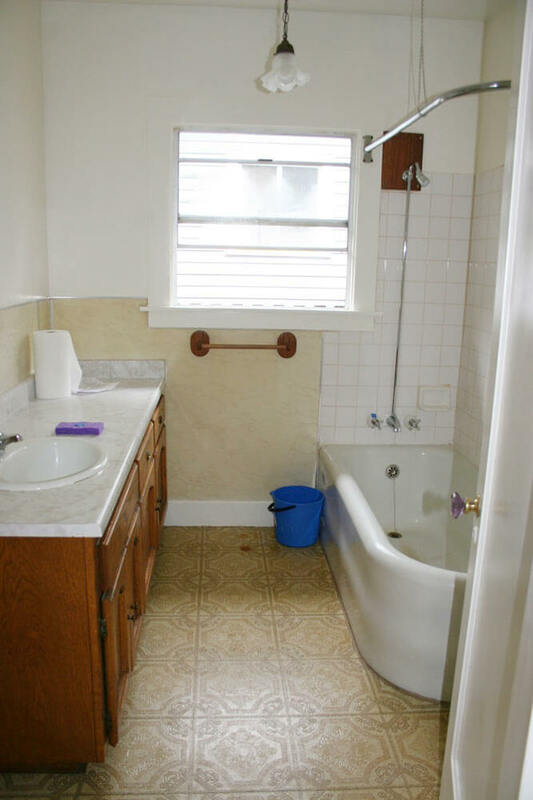 I would love to replace our tub with a shower. I was wondering if a local glass shop could also do the work on the shower doors? 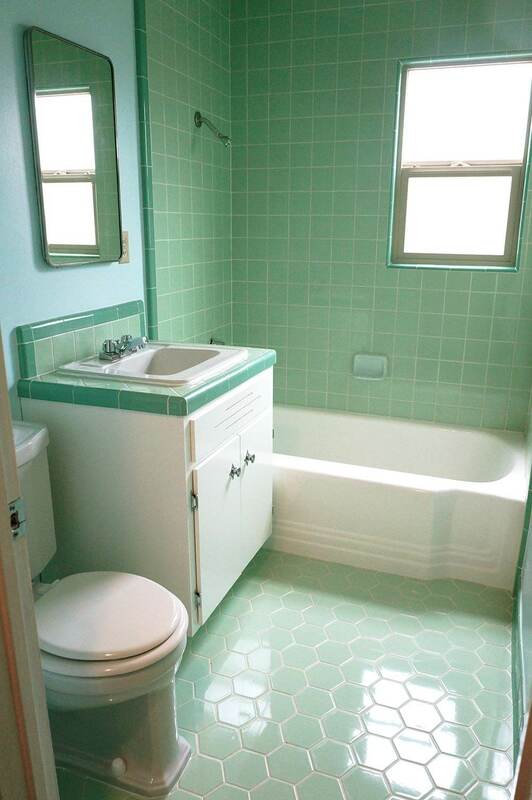 I was very interested in your 1960 bathroom remodel, but was confused with the articles before and after pictures. 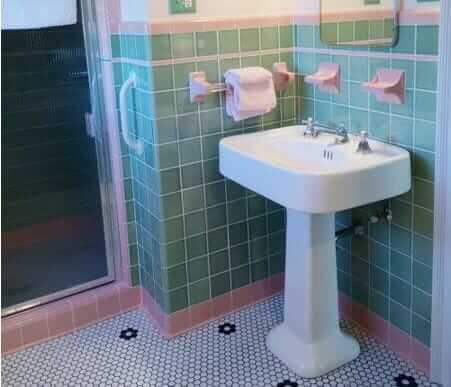 Were your bathroom fixtures actually pink or turquoise? The before and after pictures are very confusing to the actual remodel. There is only one “Before” photo — it is toward the top and it is captioned “before”. The rest are “afters”. Based on your comment, I just shrunk and wrapped the Before so it’s less confusing. Just wonderful! 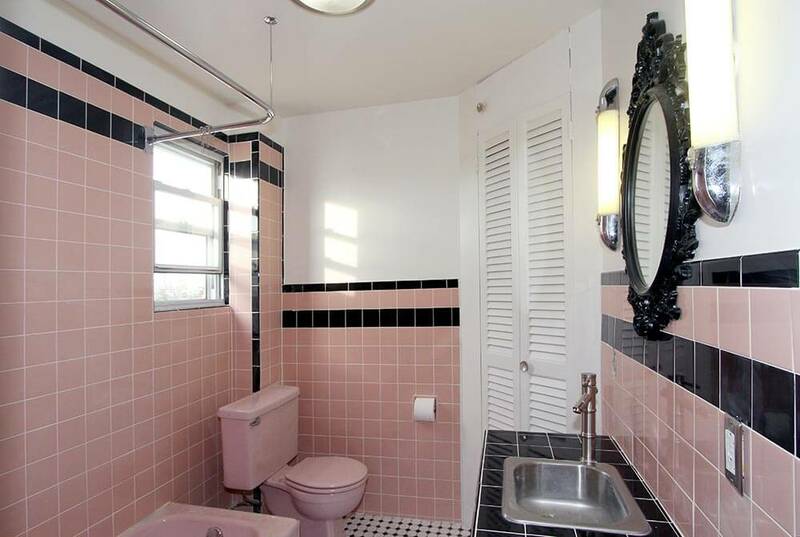 I love how you picked up the same colors in paper, tile and floor tile. 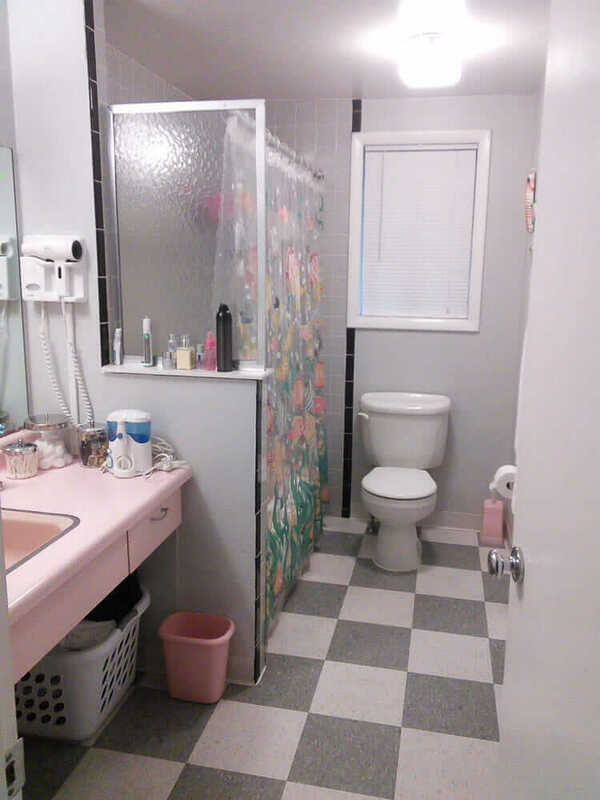 I especially like the floor since it reminds me of our bathroom growing up. One question: I went online to look up Daltile Golden Glitter, but all I could find was Golden Granite. Is that something different? Or did they change the name? Congratulations on the dream do over! I think it IS Golden Granite. I will fix typo.